Art therapy in addiction treatment is a form of expressive therapy. It uses the creative process of making art to improve our patients physical, mental, and emotional well-being. The creative process involved in expressing one’s self artistically can help our patients to resolve issues. It also helps them to develop and manage their behaviors and feelings, reduce stress, and improve self-esteem and awareness. You don’t need to be talented or an artist to receive the benefits. Our Art Therapist will work with you to dive into the underlying messages communicated through your art. This will aid in the healing process. Art therapy can achieve different things for different people. It can be used for counseling by therapists, healing, treatment, rehabilitation, psychotherapy. In the broad sense of the term, it can be used to massage one’s inner-self in a way that may provide the individual with a deeper understanding of him or herself. Art therapy is sometimes called creative arts therapy or expressive arts therapy. It encourages our patients to express and understand their emotions through artistic expression and through the creative process. Art therapy in addition treatment is a form of expressive therapy that uses art materials. These materials include paints, chalk, and markers. This kind of expressive and creative therapy combines traditional psychotherapeutic theories and techniques with an understanding of the psychological aspects of the creative process, especially the effective properties of the different art materials. 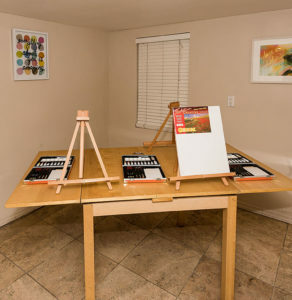 Art therapy in addiction treatment at Dedicato Treatment Center involves the creation of art. This helps our patients increase awareness of themselves and others. This, in turn, may promote their personal development, increase their coping skills, and enhance their cognitive function. It is based on personality theories, human development, psychology, family systems, and art education. We have art therapists that are trained in both art and psychological therapy.